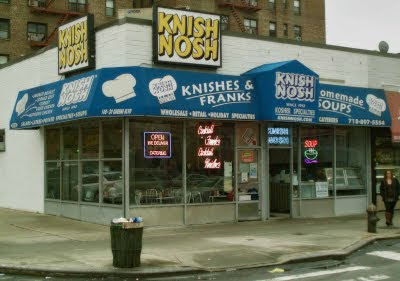 Knish Nosh, here on the corner of Queens Boulevard and 67th, is like stepping back in time to 1971. If Gene Hackman pulled up in a dented Plymouth sporting a porkpie and sat down next to me, I might not have batted an eye. 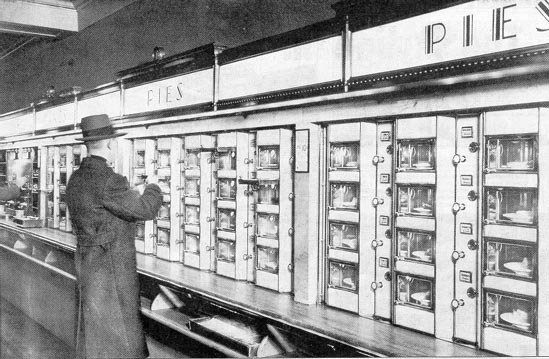 You almost feel like there needs to be an automat down the block. 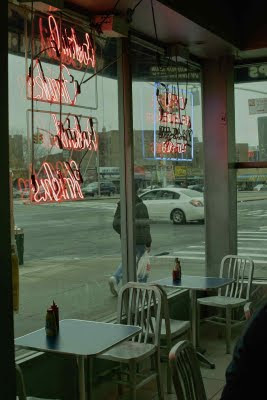 The blue and white interior, with its faded-to-brown newspaper reviews on the windows, the pale glows from their neon, and their polished aluminum tables and chairs hearken back to a time when diners and delis couldn't care less about decor and the only flavor coffee came in was wet. 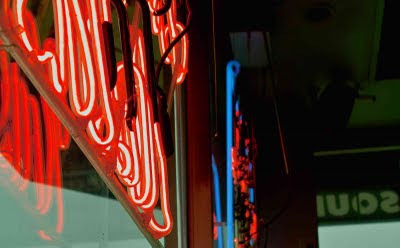 If Knish Nosh was in Williamsburg, hipsters would flood the place for its retro, purposefully un-modern feeling and Time Out New York would set up a satellite office there. But damn it if Forest Hills ain't Billyburg. Each of the Knishes I've had here over the years have all been good, with a crispy shell and piping hot filling. But you have to like, or not mind, getting a week's worth of carbs in one meal, and I won't gloss over the extreme guilt I feel whenever I eat here... my poor waistline. 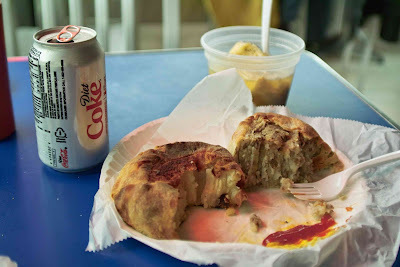 I debated describing every knish I've tried, but I've decided that doing such a thing would be overkill. You either like giant potato/meat/cheese/veggie filled baked pies or you don't. I do, especially the beef one (see photo, left side). As for their Matzo Ball Soup, which I tried on my most recent excursion, skip it. Fatty broth and timid matzo balls. 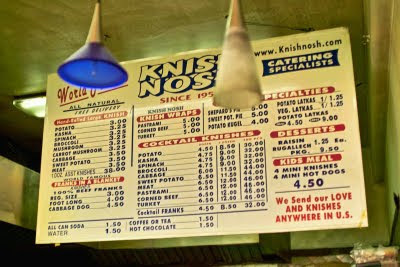 The average knish is $3.50. The board is only about half the menu.